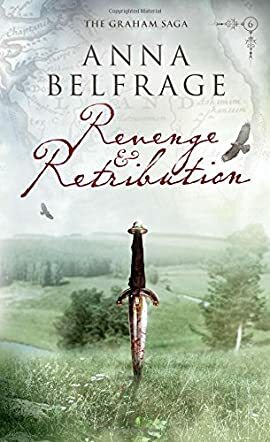 Revenge and Retribution by Anna Belfrage is the sixth book in The Graham Saga, a cleverly executed story of Alexandra Lind and her husband in her journey back to a turbulent period in history. Back in 1684, Alex and her husband are hemmed in with life-threatening challenges from all sides. She is accused of witchcraft and the worst form of punishment may await her; she loses her son to an unforgiving adversary; and Philip Burley, an arch enemy of hers desires nothing but to lay his cruel hands on her. With the support of Graham, her 17th century Scottish husband, she manages to overcome unimaginable and life-threatening moments of trial, but will she survive the next blow? This is a tale of loss, intense suffering, love and redemption, but it is also a story about settling scores. A story well embellished with historical elements and a creative imagination, Revenge and Retribution will be a sweet delight for fans of a variety of genres. The plot is cleverly knitted together, the conflict multilayered and intense, the action furiously fast, leaving readers to follow their heroes with throbbing hearts. Belfrage has the uncanny gift of seamlessly weaving together so much information into one little book and still keeping it focused and highly entertaining. The author has a gift of plot and characterization, gorgeous writing that is as poetic as it is expressive, and it is interesting to see how she combines her prose with the rare gift of plot-driven dialogue to lead the pace in this spellbinding work. The characters are so compelling and well-sculpted that they will leave no reader indifferent. Revenge & Retribution is Anna Belfrage’s sixth book in a historical fiction series that features Alexandra Lind as a traveler through time. Alex is married to a seventeenth century husband, Matthew Graham. While living in Maryland in 1684, accusations are thrown around that Alex is a witch. Even more disturbing, the accusations come from Matthew’s brother-in-law. But Alex and Matthew’s love is strong. It is strong enough to see them through all of the dangers and evils about to descend upon them. This story shows some of the darkest things imaginable to humankind, and includes sexual assault, murder, kidnapping, betrayal, and a host of senseless violence. Every time Alex thinks she is strong enough to overcome the terror in her life, something worse happens. As the violence escalates, Alex relies more and more on her husband. But even with their powerful love, they will suffer immeasurable loss. Revenge & Retribution is a historical story that doesn’t sugarcoat the hardships of life in the 1600s. It is dark and violent and will test you as a reader, but if you can stomach it, there is a lesson to be learned here. It is a story about love and growth and silver linings, and Anna Belfrage is masterful at sharing this lesson through the darkness that her characters descend into. The characters are all strong and very well-written. The story line is tight and weaves seamlessly through a historical era as if it were part of history itself. There is much to be learned from Anna Belfrage’s courageous writing. Anna Belfrage’s sixth book in The Graham Saga is Revenge & Retribution. It is a historical fiction series. Twenty-six years have passed since Alex Lind traveled 300 years through time to land in Scotland. She’s had to make many changes in her life to accommodate to her new living arrangements. Religion is one area where she has changed her views. In her life in the 21st century, she wasn't sure if she believed in God. But now, in the 17th century, she is more likely to pray daily or shake an angry fist at the heavens. Her husband, Matthew, was devoutly religious, but he has become more apt to ask questions about his faith since living with Alex. And in this saga of their lives, their faith is tested by all of the violence, darkness, and bloodshed that surrounds them. They can only rely on each other to get through these dark times, and even then they might not make it without a few scars apiece. Revenge & Retribution is aptly titled because Anna Belfrage’s tale is dark. It tackles the tough subjects of the bloodshed that surrounds both revenge and retribution. Where does it stop? When is enough, enough? Those are questions posed because in this story the violence just keeps escalating and escalating. And yet Anna Belfrage is able to write an interesting story through all of the darkness. Her characters are deep and have complex thoughts and questions about life, love, and religion. Anna Belfrage writes those scenes with a very sensitive touch and that made for a very interesting and provocative read.